You may have noticed that I have been changing the theme of my blog regularly and I would like to apologize if it annoys you. I just can’t seem to find a theme that I LOVE. Unfortunately, I am missing “IT” in my DNA and I can’t do much more than upload a photo or change the font (I refuse to pay the $30 to change the font). So hopefully this one sticks. I am seriously failing my New Years Resolutions and it’s not even February. I think I have blogged once twice this month. What you missed… completely random. I tried the giant gummy bear. Green apple delicious. Rose Nylund waking up after a nap. She gets this hilarious “smash face” and it’s soooo cute! PS Taking selfles with the iPhone5 is an art I have yet to master. The Amazing Party store opened up near my work. We needed some gear for our secret agent outfits, read my Mission Possible Story here. While we didn’t find anything re: Secret Agent costumes, we did come away with some sweet (no pun intended) additions to our desk drawers. And finally we had dinner at our friends house Friday night. She served the cutest desert. Unfortunately I had eaten most of it before I thought to take a picture of it… but you get the idea. 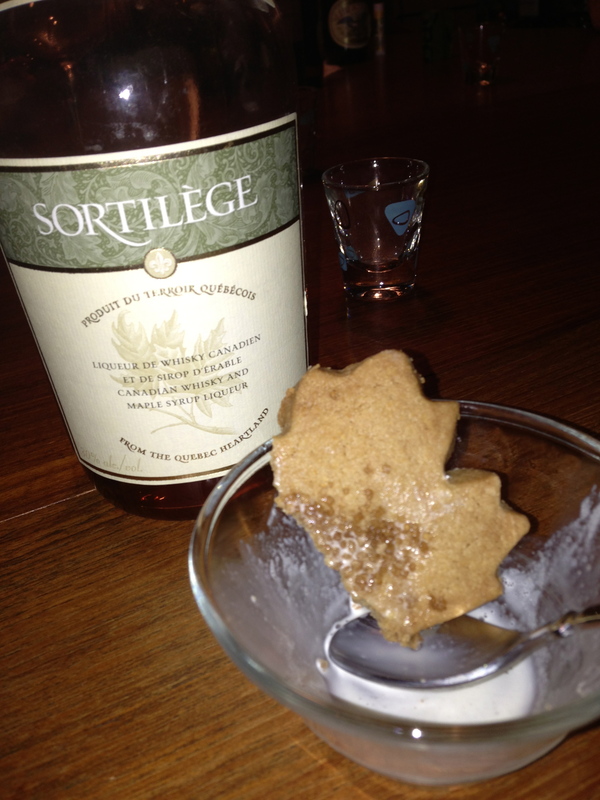 Vanilla ice cream, maple sugar cookie, topped with maple whisky! How Canadian. I have the day off today. I have every other Monday off thanks to flexible work options 🙂 I have big plans. – Cook dinner, watch a documentary on Netflix, glass of red. I struggle with iphone selfies too! maybe there’s a class for that?